Walkers will be allowed to get the train to the top of one of Scotland’s highest mountains for the first time. A ban on visitors using the Cairn Gorm funicular to access the mountain’s summit is being relaxed in a trial agreed by Highland Council and Scottish Natural Heritage. The funicular has a troubled financial history and in March this year the Scottish Parliament’s public audit committee severely criticised Highlands and Islands Enterprise for lax practices which saw the cost of the project spiral to £26.75m. 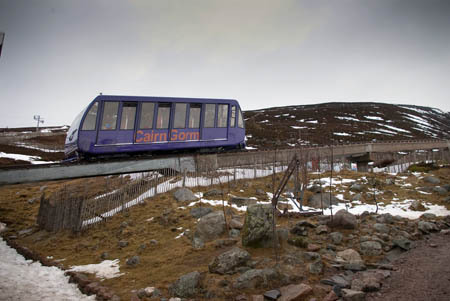 The committee’s report said the scheme had been pushed ahead without accounting for the drop in the number of skiers, although the large amount of snow that fell in the Highlands this winter meant CairnGorm Mountain Limited, which runs the funicular and ski resort, had its best season in years. The funicular opened on Christmas Eve in 2001 and replaced an old chairlift system that had operated since the 1960s. Included in the funding of the funicular was a European Union grant of £2.7m, a condition of which is the ‘closed system’ whereby walkers are not allowed outside the Ptarmigan top station and restaurant if they use the funicular. The stipulation was an attempt to keep down numbers to a manageable level to the internationally important arctic plateau, which is protected by EU laws. The UK Government must repay the grant if the 25-year-long closed system is abandoned. Keith Duncan, area officer for Scottish Natural Heritage does not believe the walkers’ trial, which will see visitors accompanied by guides, puts the cash at risk. “I don’t think so because this is strictly managed, he said. “They won’t be entering the European site, which is beyond the Cairn Gorm summit. The trial, dubbed Walk @ the Top by CML, which was taken into public ownership in 2008 when it faced going into administration, will involve a 90-minute walk around the ski areas and on to the 1,244m (4,081ft) summit, the sixth highest in Britain. Its walks will start on 17 July and continue until 31 October. Ian Whitaker, the company’s chief executive said: “CairnGorm Mountain welcomes the opportunity to manage trial visitor walks from the Ptarmigan top station this summer. “The trial walks will be carefully managed and monitored in accordance with the agreed operating procedure and all data will be subject to review by SNH and Highland Council at the end of the trial period. “This will considerably enhance the visitor experience at CairnGorm Mountain. 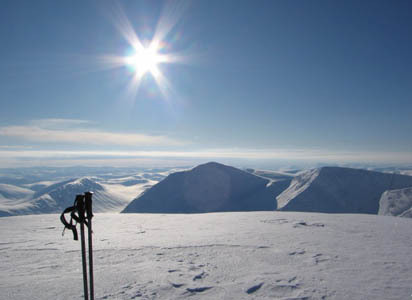 Through this type of activity, visitors become fully engaged with the mountain landscape and this will lead to greater understanding of the significance of the Cairngorms national park mountain heartland and why it is one of Europe’s most significant mountain wildernesses and worthy of the environmental protection it enjoys. He said that, on a busy summer day, the mountain railway carries 1,000 people. The trial allows for a maximum peak capacity of 140 people per day taking part in a walk at the top. As well as keeping a record of the numbers who book onto a walk, CML will also record the numbers we have not been able to accommodate but who wish to undertake the activity. Keith Duncan confirmed the scheme could be extended. He said: “We are open to any proposal that CairnGorm Mountain may want to put forward. We are open to any amendment providing it won’t impact on the European site. Mountaineering Council of Scotland chief officer David Gibson said that MCofS welcomed the opportunity the initiative will bring to people with limited hill walking experience or mobility to enjoy the mountains. He added: “We understand that the public will pay for ‘guided walks’ and that these will be organised in groups of 10. It appears that these guided walks will be closely managed to specific areas of the mountain and will not affect the mountain’s Natura 2000 habitat. “While we haven’t been consulted on safety matters by Cairngorm Mountain Limited, we would assume that they have undertaken appropriate risk assessments and that walks will be led by qualified or experienced people. The walks will cost £13, with reduced charges for senior citizens and children. The charge includes a return funicular ticket. An invitation-only event will take place on 14 July, with the public service, for which booking is advised, starting the following Saturday. The funicular project sparked opposition from its outset and has been dogged by controversy during its nine-year existence, much of it centred on the financing of the railway and associated resort. There has been increasing pressure to allow summer visitors out on to the mountain to boost visitor numbers. In May last year, Ramblers Scotland called for a halt on any further public money for the project. Director Dave Morris said: “An absolutely huge sum of public money has been spent on this, but when it started its life it was supposed to have been private-sector led. We always held it was built in the wrong place. The Cairngorm mountains are one of Europe’s largest wilderness areas and their northerly latitude, harsh climate and thin soils provide a unique habitat for many arctic and alpine plants and wildlife not normally associated with the UK. Most of the land surrounding the ski area is protected under European and UK environmental laws. Since the opening of the mountain railway in 2001, its visitor management plan has been operating to protect the high mountain core of the Cairngorms national park, with visitors wanting to walk in the high tops of the Cairngorms not allowed to use the mountain railway as a quick means of access onto the high plateau, but encouraged to walk from lower down the mountain.